Radon is an odorless gas that is given off from the breakdown of uranium in rocks and soil. As with any gas, it can become trapped inside the house and can even get into drinking water, posing a serious health hazard to people. Just as too much radiation from the sun can cause damage to the skin and lead to skin cancer, radiation emitted from rocks and soil can lead to lung cancer. Radon is the number one cause of lung cancer among non-smokers, causing 21,000 deaths each year. How can you tell if there is radon in your home? You can't see or smell radon. The only way to find out is to have your home tested by a radon expert. The test takes two days to perform and may cost around $100, but it is well worth it. The equipment takes periodic radon readings in the home over a period of two days and an average level is reported, along with the highs and lows. According to the EPA, any level above 4 picoCuries per liter of air (pCi/L) is unsafe. The World Health Organization says that anything above 2.7 pCi/L is a health concern. To help you decide which level is safer, a radon level of 4 pCi/L is roughly equivalent to smoking 10 cigarettes a day. 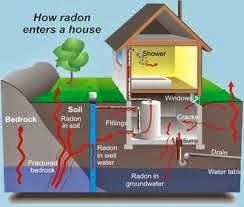 How can radon be treated? The treatment of high levels of radon is done through a process called mitigation. It is called mitigation for a reason. The process cannot totally remove all levels of radon, but it can greatly reduce, or mitigate, the radon to much safer levels. Mitigation is a specialized process done by professionals that consists of drawing the radon from below the home and venting it through a pipe to the outside at a level above the home where it is dispersed into the open air where it dilutes and poses no health threat. Mitigation is an expensive process that can cost between $1,000 - $2,000.